A few days back one of my friends asked me what I was making , I said that I was waiting to get motivated . When I opened a fresh loaf of bread I was shocked to see some vague white streaks in the slices. It couldnt be fed to birds , dogs , what if they fell sick ?? The only way out was to make bread craft !! 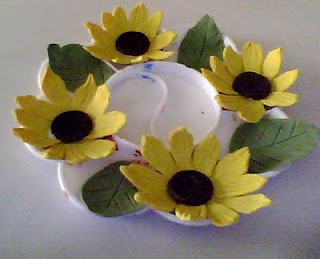 These sunflowers and leaves have been handmade with the recipe given in this blog which works fine with me. The flowers and leaves are happily drying in the color palette which I had bought because of its shape and not because I needed it. Lets see how I finally arrange them as I have not put wires/stems this time . 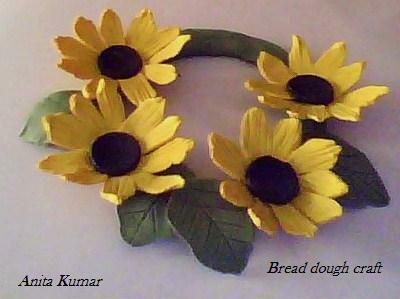 Well, I finally made a wreath of the leftover bread dough and pasted my dried sunflowers, leaves on it !